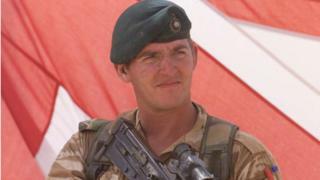 A Royal Marine jailed for killing a wounded Taliban fighter in Afghanistan is to be freed within weeks. Sgt Alexander Blackman received a life sentence in 2013, but his murder conviction was reduced to manslaughter after a high-profile campaign. The 42-year-old has been sentenced now to seven years for the lesser charge, but because of time already served, he will shortly be released. The 2011 shooting took place after a British patrol base came under fire. Blackman was convicted of manslaughter on the basis of diminished responsibility, and his supporters had hoped he would be reinstated to the Royal Marines. However, his dismissal from the service remains, although it is no longer dishonourable. Media captionClaire Blackman asked the media for "some time together to readjust"
In 2011 one of two insurgents was seriously injured by gunfire from an Apache helicopter sent to provide air support, and the marines from 42 Commando found him in a field. Blackman, from Taunton, Somerset, was known as Marine A during the original trial process and fully identified after he was found guilty. He was not at the Royal Courts of Justice in London for the sentencing but appeared via a video link from prison. Blackman's wife, Claire, led a campaign alongside author Frederick Forsyth and the Daily Mail newspaper for his conviction to be re-examined. Standing outside court with her lawyers and cheering supporters, Mrs Blackman said she was "overjoyed at the judges' decision to significantly reduce Al's sentence, such that he can be released imminently". "This is the moment we have all been fighting hard for". The trial was the first time a member of the British armed forces faced a murder charge in relation to the Afghanistan conflict. 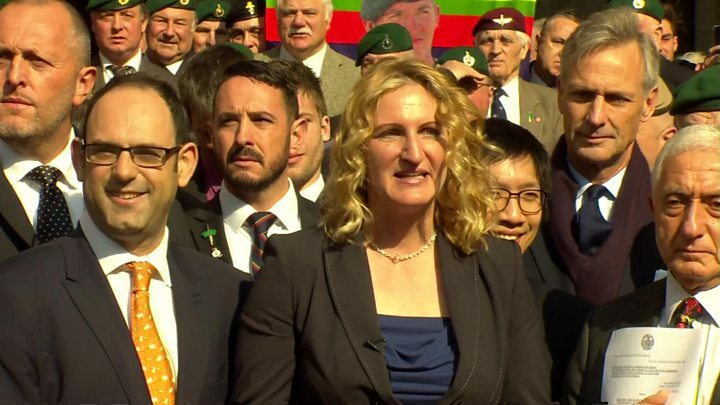 Two other marines from 42 Commando were tried at the same time but acquitted. Judges at the Court Martial Appeal Court in London had been told he had a recognised mental illness at the time of the killing. His defence team argued the conviction was "unsafe" and fresh psychiatric evidence, if available at the time, would have provided him with a "partial defence". But in their sentencing remarks, the judges said that although Blackman's responsibility was diminished, he "still retained a substantial responsibility for the deliberate killing". They added: "The appellant's actions can be used by the insurgency and others as evidence that the killing of the insurgent was in breach of the values proclaimed for which the International Security Force and HM Armed Forces had been sent to Afghanistan." They said other "aggravating factors" included the vulnerability of the insurgent, who could not defend himself, and "the decision to ensure that the killing was not witnessed by the overhead helicopter and thereafter to cover up the evidence of what had happened". Patrick Hennessey, a barrister and former Army captain, said it was important to remember that a crime had been committed - "that's clear in black and white - no-one is disputing it". He also said it was wrong to suggest there had been any miscarriage of justice as the original Court Martial Appeal Court had not seen evidence Blackman was suffering from a mental illness at the time of the incident. But he added: "The MoD [Ministry of Defence] must be really careful to examine how it can make sure that soldiers aren't put in the same stress situations that Alexander Blackman was put in." The killing on 15 September 2011 took place during the final month of 42 Commando's six-month tour of duty to Helmand province - a deployment which saw the unit lose seven men. Footage from an unofficial helmet-mounted camera of another marine was found during an unrelated investigation and showed Blackman shooting the Afghan prisoner in the chest at close range with a 9mm pistol. The court martial heard that Blackman used abusive language and said: "There you are. Shuffle off this mortal coil." He then turned to his comrades and said: "obviously this doesn't go anywhere, fellas. I just broke the Geneva Convention". Blackman told his original trial he believed the victim was already dead and he was taking out his anger on a corpse. Blackman had been "an exemplary soldier before his deployment"
It was "clear that a consequence was that he had developed a hatred for the Taliban and a desire for revenge"
At the time of the killing "the patrol remained under threat from other insurgents"
Blackman had more than 13 years of service and had previously been deployed to Iraq on three occasions and to Afghanistan in 2007.